Florida pompano are laterally compressed fish with blunt snouts and small mouths, somewhat resembling piranha. The fish are shiny and silver in color, with adults developing yellow on their bellies. Adults of this species also bear dark gray dorsal fins with the other fins being yellow in color. Occasionally, some Florida pompano have orange pigments on their fin tips and underside. Florida pompano are active swimmers because they have no swim bladder and therefore rely on hydrodynamic lift to maintain position in the water column. Florida pompano is primarily a carnivore of small fish, small mollusks, and crustaceans. Naturally forms schools. 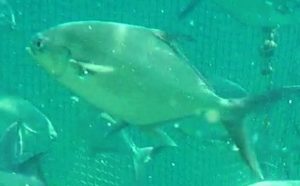 The natural migratory range of the Florida pompano spans from Massachusetts to Brazil, as they head for cooler waters in the summer and warmer waters in the winter. This species is not aggressive but is a predator of most invertebrates and small fish.